The new Ford Flex is the popular three-row midsize SUV that offers drivers comfort features that you would expect in larger and roomier vehicles. Although the new Ford Flex has seven seats, you still have plenty of room to haul your belongings thanks to the PowerFold third-row seat. Open the rear tailgate and hit the PowerFold button, and the third row of seats collapse into the floor to provide you all the hauling space you will need. 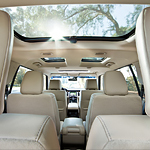 Even though there are seven seats inside the new Ford Flex, getting to all the seats is a breeze because of the second-row bucket seats with pass-through. Simple walk right through the middle row to the third row without having to step on or climb over the other passengers. Take the new Ford Flex for a test drive when you come to see us at Midway Ford Truck Center and see these comfort features up close.